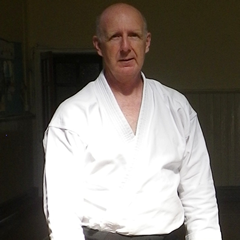 Huw Collingbourne (2nd Dan) is the founder and principal instructor of the Hartland Aikido Club. He began studying aikido in 1983, graded to 1st dan in 1989 and to 2nd dan in 1992. In the 1980s and ’90s, he trained under Sensei David Currie (7th dan) first with the Ki Federation of Great Britain and later with the British Ki Aikido Association. Sadly, Sensei Currie no longer lives in Britain and Huw has not sought any further gradings from other teachers. 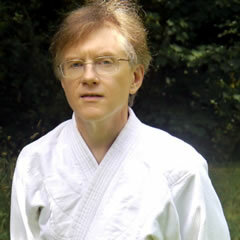 Huw formerly ran the Queen’s Crescent Aikido Club in North London. He strongly believes that aikido has no fixed boundaries and he welcomes practising with people from all ‘schools’ of aikido. Dermot Hogan (1st dan). Assistant instructor. Dermot has studied aikido since the 1980s, initially with Sensei David Currie (British Ki Aikido Association) and Sensei Andy Hathaway (London Aikido Club). More recently he has spent many years studying aikido with Sensei Huw Collingbourne and the Iwama weapons system with Sensei Richard Small. 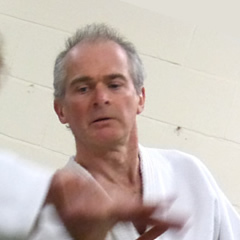 Pete Blayney (1st Dan) started aikido in 1984 in Northampton with Senseis Bob Sherrington, (now Kettering Aikikai), and Aubrey Smith, (now Aikido Northampton, Duston). Over the years he has trained with many styles and teachers and is still passionate about the art: “It’s a journey, there is always a lot to learn, the great thing about aikido is we are all teacher and pupil, mechanic and artist”. Pete has run clubs in Combe Martin, Northam and Bideford, he is a full-time hypnotherapist and trainer (www.northdevonhypnotherapy.co.uk): “For me it’s a way of being, the relationship of mind, body and spirit is about eloquence and congruency, within ourselves and in our relationship with the world around us”. Pete remains an honorary member of the club though we rarely have the opportunity to practise with him as he now lives in France. 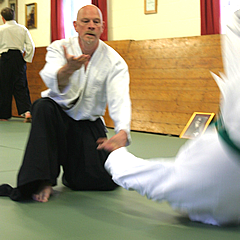 Richard Small - Senior Weapons Instructor - (4th Dan TIA Europe), now teaching Aikijo, North Devon (http://aikijo.weebly.com/). Member Instructor of 'Martial Arts & Fitness Coach UK', Certified Coach with BAB. Richard started Aikido in the mid 1970s, at Sensei Aubrey Smith's Wellingborough club, moving for work to another County, going slowly through the grades until awarded 3rd Dan in 2007 at Cambridge by Sensei Tony Sargeant and Paul McGlone. Awarded 4th Dan April 2013, after forty years of study. Some of the teachers seen on workshops or seminars, in no particular order; Pat Hendricks 7th Dan, Toyoda Shihan, Saito Sensei 9th Dan, Bill Smith, 5th Dan when I saw him, Mathew Hill, Bill Harris, Miles Kessler, Kanetska Sensei, Chiba Sensei 8th Dan, Yamada Sensei 8th Dan, Tamura Sensei, 9th Dan - if not should be ... brilliant, Daniel Toutan, Andre Noquet, Pat Stratford and many more.Trained in Holland, Switzerland, France, Greece, Russia and Jersey as well as the mainland UK; attended some 130 courses, excluding teaching and coaching courses. Taught at Sensei Sargeant's Orwell Dojo on a regular basis and was invited to teach in Holland while a resident teacher was on holiday. Iwama style of schools train, from the beginning, in weapons, which constitute about fifty percent of the training. Their purpose is to change the body.